ADD/ADHD, Autism and Low Carb Keto Diet, etc. Wish I could watch the whole thing. This is a short success story in print on a website. An encouraging follow-up to the article in post #15 above from Anne Mullens at DietDoctor. This is great Janet!! It confirms what I see. The mom mentions bento boxes, and the selection is huuuuuggge. Should be able to find a leakproof design with several compartments. Nothing can mix for my son. And 0 can leak. All containers we have tried are messy, and that has limited his daily yogurt to sugar filled t ypes in prepackaged individual serving size. I was happy to find last week a no sugar added, but the 0% fat is unacceptable. Last edited by JEY100 : Sat, Jun-02-18 at 03:07. Will check out TJ.... I'm hoping with LC becoming more popular and keto , too, that regular fat yoghurts will make its way to the grocery shelves. I found mine in Walmart, of all places. Great Value Whole Milk Greek Plain. Ingredients: cultured pasteurized grade A milk. 3.5% milk though, thought it went up to 4%. 3.5% is the average milk fat for cows milk. That is the standard. This is an acceptable level in my book, though 5% is even better for keto. Homemade yogurt made with half and half is good, which brings us back to a leak-proof container. I have a stack of small size ones that were in a big collection of Rubbermaid easy find lid containers. Use them for dressings and they don’t leak, in fact hard to pry off. Rubbermaid also has a set called Lunch Blox (but they stack with the ice block so not all visible like the Bento box. Certainly would be easier to find individual yogurts in TJs! Look for the new Icelandic yogurt. 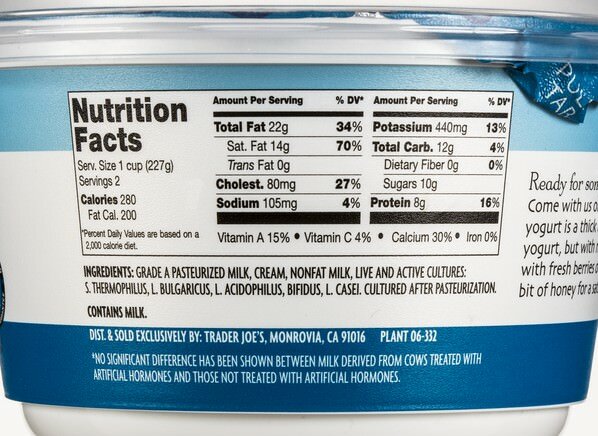 https://www.traderjoes.com/digin/po...e-nonfat-yogurt. Sadly non-fat but tasty, And believe have seen a Greek small cup made with whole milk. Last edited by JEY100 : Sun, Jun-03-18 at 03:18. Otherwise I will make my own if I can get a trulet leak proof container. The MANY Bento boxes have given my hope that containerized foods will appeal to my son, even if it is tupperwear or another. Maybe if I seet it up as reasearch he will bite and try several. ...Rubbermaid also has a set called Lunch Blox (but they stack with the ice block so not all visible like the Bento box. Those look good - thanks JEY100! I can relate to the fath[U]er, Barry, the regrets that we could have done more. If I could tell him, how could you have done more? Looking back and criticizing is easy, how can you apply what you didnt know? And in that moment that I am thinking this, I realize that I need to tell that to myself. We are parents struggling in the face of little to no support..... and didnt quit. In Trader Joe's early this morning and looked carefully at all the Whole milk yogurts in Individual sizes. Some of them had up to 30g!! of carbs, the second ingredient is cane sugar. So there are whole milk plain without added sugar in larger containers, Greek and European, and best for a 7oz individual cup is Fage 2%, which I have also seen in a regular grocer too. https://usa.fage/yogurts/fage-total-plain#fage-total-2 Nothing but milk and bugs. Would your son chew a meat stick? On the new product shelf is a Turkey Chomps, not even on Chomps website, must be a TJ exclusive. 0g carb. On my one and only visit to Trader Joe's the other week I got a couple of 16oz Trader Joe's Greek whole milk plain yogurt; 12g carbs for a 1 cup serving. In this video interview with Dr. Derrick MacFabe we discuss the fascinating new research that connects changes in gut bacteria to autism spectrum disorder. Dr. MacFabe is on the leading edge of this research so I hope you find this interview as intriguing as I did. Without question, it’s been very difficult to try to determine what may be causing this virtual epidemic to be worsening over time. Over the past five years, researchers have been focusing their efforts in an attempt to relate risk for autism to events occurring not in the brain, but in the gut. This line of research certainly makes sense when you consider how frequently gastrointestinal symptoms are seen in those who are diagnosed with ASD. It is certainly very good news that progressive scientists are embracing the notion that ASD may have its origins, at least to some degree, outside the brain. A small study led by investigators at MassGeneral Hospital for Children (MGHfC) and Johns Hopkins University School of Medicine has found evidence that daily treatment with sulforaphane – a molecule found in foods such as broccoli, cauliflower and cabbage – may improve some symptoms of autism spectrum disorders. In their report being published online in PNAS Early Edition, the investigators describe how participants receiving a daily dose of sulforaphane showed improvement in both behavioral and communication assessments in as little as four weeks. Last edited by s93uv3h : Thu, Jun-14-18 at 11:31. All times are GMT -6. The time now is 09:51.